When it comes time to replace a dishwasher, microwave, or even a furnace, you try for the best model you can afford. But what about when the water heater needs to be replaced whether due to age or an unfixable leak? Because of urgency, you may be tempted to simply head down to Home Depot and get whatever’s on sale without even doing research or reading any water heater reviews online. But this vital component of your home isn’t cheap and a substandard model may prove expensive or even problematic in the long run. So what is the best water heater for your home? The following options take the guesswork out of shopping for a hot water heater that won’t leave you in the cold. Not sure what type of water heater to get? Check out our quick rundown of the different types of water heaters. Who’s the Best Water Heater Manufacturer? When it comes to tankless water heaters, you want only the best. Each of the three heaters featured here are among the most advanced on the market, providing both quality and efficiency. It may be a tough decision switching to a tankless heater if you haven’t used one before, but Rinnai gives plenty of reasons to switch with the RUC98iN. With its high 9.8 gallons-per-minute (GPM) flow rate, it’s perfect for families. You’ll never run out of hot water again so whether you have multiple teenagers in the home with their hot water needs, enjoy extra long showers, or simply want to completely fill up your large soaker tub, you’re covered. The RUC98iN uses an electronic ignition that meets both California and Texas NOx emissions standards and is compatible with all Rinnai digital controllers. Boasting a thermal efficiency of 95 percent, expect your gas bill to be lower even with increased water use. Residential users can set the temperature between 98 and 140 degrees while commercial installs can go all the way up to 185 degrees (with an optional commercial controller). Not only does this water heater have a gas rate input of 15,200 to 199,000 BTUs; but also comes with a 12-year warranty for the heat exchanger, 5-year parts warranty, and a year warranty for labor, making this perhaps the best residential water heater on the planet. While smaller households (1-2 people) may not need the output of this water heater (see the Takagi below instead), it’s an excellent option for larger households. This Rinnai is the exact water heater we installed in our home earlier this year. In all honesty, it blows any tank water heater out of the water and is well worth the higher cost. We can have 2 showers, a washing machine, and a dishwasher all running at the same time and there’s still plenty of hot water to go around. One of the best purchases we’ve ever made. Some of the most satisfied users originally avoided this model due to the higher cost of installation versus a tank model, only to find the RUC98iN pays for itself over time. It requires less gas to run and is as quiet as a fan, giving those with finished basements more space and less noise. Consumers who have run the heater through tests state that there is a slight dip in pressure for non water-saving shower heads, but there’s no delay in second floor showers. They have further noted that you can run hot water taps or multiple showers simultaneously without affecting the hot water supply. While most people are happy with the RUC98iN, some have complained about parts issues and service. According to these complaints, Rinnai’s customer service prefers to replace individual parts before replacing an entire unit, causing these individuals to remain without hot water for long periods of time. While these complaints are not the norm, they should be taken into consideration. Sometimes you want an intuitive natural gas tankless water heater. The Rheem RTGH-95DVLN boasts a 94 percent energy efficiency, low NOx emissions, and intelligent electronic controls. The excellent 9.5 GPM flow rate is almost on par with the Rinnai above and also allows plenty of non-stop hot water for families. Its stainless steel condensing heat exchanger also means a longer lifespan for your heater. With a 199,000 BTU/hour capacity, this heater can function in most homes without needing to alter the meter, although some modifications to plumbing may be necessary. A good number of consumers have chosen to install the RTGH-95DVLN themselves, noting that the instructions are clear and easy to follow if you have a bit of plumbing experience. Some may even say the Rheem is a bit easier to install than Rinnai but the process is similar. Owners have also noted a drop in both noise and bills. Like the Rinnai, owners love the Rheem’s ability to allow multiple hot water taps and/or showers to be run simultaneously without a drop in water temperature. The biggest complaints from owners of this model aren’t with the product itself, but with warranty issues. According to some reports, Rheem will at times void the warranty on even minor deviations from their requirements, even if that deviation has nothing to do with the problem. Thankfully, those who have bought from certified resellers, such as Amazon or Home Depot, have reported that those sellers will honor the warranty, even though Rheem may not. Takagi has created an amazing natural gas tankless water heater for those who want an environmentally-friendly alternative at a great price. Running at 140,000 BTU, energy factor of .81 to .83, and a maximum flow rate of 6.6 gallons per minute, this heater is perfect for smaller households but may not be enough for moderate to large families. The unit requires a 4-inch category III stainless steel vent, but may be converted into a direct-vent unit. One of the most interesting complaints about this heater is that it does not work with water-saving fixtures. Despite being designed to be efficient and reduce costs, the unit will only run while there is a minimum flow of 1/2 gallon per minute. Between this and an anti-DIY warranty restriction, this heater is a poor choice for those in water-restricted areas. But for everyone else, it’s a great option and probably the best budget tankless hot water heater out there. This Rheem Performance Platinum may possibly be the best 50-gallon gas water heater for medium-sized households. Beginning with a 40,000 BTU/hour, low NOx burner, this heater provides ample water at a lower cost than older models. The savings continue with a maintenance-free combustion air intake system and self-diagnostic gas control valve. A simple push button ignition system makes for safer startups, while the tank’s lifespan is increased by a premium grade anode rod. The heater comes with a 3-year in-home labor warranty, a 12-year limited warranty for tank and parts, and full 2015 NAECA compliance. With a 0.62 energy factor, 86 gallon delivery in the first hour, and ability to provide for homes up to 8,500 feet in elevation, this tank provides excellent efficiency for most homes. A large percentage of owners have installed the heater themselves, with little or no issue and minimal cost in additional parts. Those who have owned this model for a long period of time have noted that there is no leakage, and hot water is consistently provided. In the few cases where the unit was damaged upon delivery, consumers have noted that replacement was quick and pain-free. The single largest problem with this heater is that it doesn’t meet the current Ultra Low NOx emissions standards in California, meaning that residents cannot install non-ULN water heaters in certain air quality districts. Other complaints have been geared towards poor warranty support, leaving many users stuck without hot water for periods of time or given limited replacement options. The XCG-50 ProMax may is one of the best 50 gallon water heaters on the market. Starting with a corrosion-resistant blue diamond glass coating, this heater is built to last. With a 40,000 BTU/hour input and an 81 gallon First Hour Rating, there’s plenty of hot water from a fully heated tank and faster than average recovery (for a tank water heater). The internal microprocessor provides more precise sensing and quicker heating response, while the thermopile-powered electronic gas valve runs the gas control without needing external power. Meanwhile, a Dynaclean diffuser dip tube made of durable PEX cross-linked polymer further extends the life of your tank. Those who have bought this direct vent model for a busy household have noted that it provides ample hot water for their entire family. Additionally, installation was quick and easy for those upgrading from an older gas heater, with few or no additional parts required. Another feature that consumers love is the control panel, which not only allows easy adjustments, but includes a flashing indicator light with full flash code guide posted beside it to allow for quick problem-solving. Generally, owners have not had much to complain about. Installation is pretty straightforward and the 10-year warranty allows peace of mind even though you will probably never need it with an A.O. Smith. 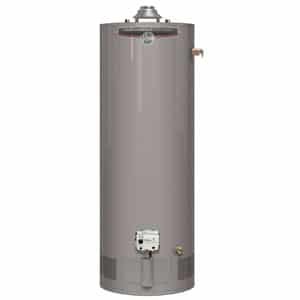 If you’re looking for a new water heater for a family of 4 (maybe 5) or less, this 50-gallon model is a great option. Larger families or those that love long showers may want to consider a tankless model instead of going with a larger tank (where the price jumps up a bit). Electric water heaters remain popular, and are the best option in regions where natural gas is limited or expensive. They also function well in homes that are supplemented by solar or other alternate electrical sources. Rheem’s Performance Platinum line isn’t just for gas tanks. This 50-gallon hybrid model is four times as efficient as standard electric models, and is estimated to provide an energy cost savings of as much as $4,000 in a 10-year period. This heater is compatible with the EcoNet WiFi kit to provide instant mobile alerts, and includes a 10-year home warranty and additional 1-year in-home labor warranty. A built-in leak detection feature and multiple modes to provide only as much hot water as needed can further reduce bills. This hybrid is easier to install than you may think and includes a premium brass drain and stainless steel elements to make maintenance a breeze while extending the tank’s lifespan. Owners have noted that this tank has been extremely easy to install and provides ample water for their households. The unit heats quickly and only activates as-needed, which has impressed many eco-aware owners. Additionally, the ability to link the heater to WiFi makes this ideal for many users who like to monitor their footprint. This is next-gen stuff that’s actually helpful. There are a lot of considerations regarding the design which have caused problems for consumers. A taller clearance, as well as the positioning of intakes, drain valve, and overflow on the front of the unit have been subject to many complaints by owners who have their heaters in finished basements or have needed to do extensive plumbing to connect the tank. For typical garage installs, there’s generally no issue. Rheem’s fourth entry on this list (we’re fans) is another model from their Performance Platinum line. This electric model is one of the most popular electric water heaters out there. It’s fully WiFi compatible and includes built-in leak detection. It can provide up to $900 in energy savings, while also providing 10 gallons more per hour than the competition. Additional features include self-cleaning, stainless steel elements, and a 12-year warranty with 3-year in-home labor warranty. Consumers have frequently reported installing this model themselves with little or no difficulty. The digital readout has proven clear and concise for both younger and older owners. In addition, the vacation mode and other features have proven a bonus for many customers who prefer low maintenance requirements and minimal settings adjustments. The primary complaint with this heater is similar to those of other Rheem products. Several consumers who have run into problems have met with bad experiences speaking to customer service. Some have noted their warranties were voided (due to improper installs), while others quote refusals to maintenance by their technicians, requiring calls to the local plumber. There are two ways to approach the discussion of who makes the best water heater. The first method is to look at the market shares of the various manufacturers, but Consumer Reports suggests that the most practical method is to look for the company that offers a product that meets your particular needs more closely. This could mean the consideration of several points, including the tank size, heater type, support level, and more. Buying from the largest manufacturer may typically give you a broader warranty, but purchasing a unit that matches your family size and efficiency goals can provide you with more savings over time. By market share, the water heater industry is dominated by a handful of brands. American Standard – Produces residential and commercial water heaters. Bosch – Electric, gas and solar waters heaters, as well as mini-tank systems. General Electric – Manufactures electric water heaters. Steibel Eltron – Specializes in small, tankless and water pump systems, respectively. Notable foreign manufacturers include the Giant Company, a Canadian manufacturer recognized as the first to implement a 3 element heating system, and the Swedish Nibe company, which makes water heaters and heating pumps. Whirlpool (a subsidiary of AO Smith). On the other hand, Consumer reports also recommends putting a little more research and planning into your purchase, and offers some valuable tips for selecting a unit, as we will discuss in the following section. The most commonly used types of water heaters are: Traditional storage tank units, tankless units, heat pumps, solar water heaters and condensing units. How big a water heater you need will depend on a few factors. Buying a tank that is too small will leave family members frustrated at the lack of hot water, and getting a tank that is too large simply uses unnecessary energy to heat water that is never needed. A longer warranty is usually better, and the best warranties are typically available from the companies with the largest market share. Plastic tends to be less expensive, but brass is longer lasting and more easily replaced. Designed for a reduction in corrosion and buildup inside the tank. This can help you monitor the energy usage of your water heater and help you fine-tune the settings for maximum performance. In some cases, the fuel source of your water heater will depend on the existing design of the home, but changing from electric to gas is not especially expensive aside from the need for a licensed contractor to perform the conversion in many locations. Solar water heaters are great, but they often work better as a secondary system, heating the water or keeping it hot without eliminating the availability of water heated by gas or electric. Even a small solar water heater can cut your annual energy costs dramatically (depending on your climate) and in some cases, larger systems make gas or electric unnecessary. An indirect water heater system can also be an option for some. Not widely popular, it can be one of the most efficient systems out there. Taking the factors above into account, you may discover that the best brand for your home is not the leading brand by market share. The length of warranty outweighs, for example, the additional cost of anti-corrosion devices, and the size of the tank is more important than factors such as plastic drain fittings. We all have different water usage requirements, and you will have to do the calculations and comparisons to find the best water heater for your needs. If you hire a professional to install your new water heater, they will most likely remove the old one for you. But what do you do with the old one if they don’t take it away or you install the new water heater yourself? Be sure to check out our guide on Water Heater Disposal. service is a very good record. In my new home, the original hot water heater lasted 7 years. Had I not had an insurance policy with the power company I would have had an AOSmith installed as a replacement. Wow, 31 years is incredible. Probably a good idea to have it replaced before the owner took possession but still, that’s great. What size tank would I need for a family of 5? We’re starting to build a home and haven’t decided on a model yet. Honestly, going with a tankless model on a new construction for a family of 5 is a MUST HAVE. Not sure how old your kids are but when there are teenagers in the house, you’ll understand. With a new construction, it’s so much easier putting in a tankless water heater compared to swapping a tank for tankless. You’re in a similar situation as we were and the Rinnai at the top is the obvious choice. What about tankless electric water heaters??? The only time I’d really recommend an electric tankless for whole-house use is if you live in a warmer climate and there are only 1-2 people in the household. The flow rate (which is reduced even more in cooler states) simply won’t be enough for most households. But if the above criteria fits your situation, good electric models such as the Stiebel or EcoSmart do come at a lower cost, especially when you factor in the somewhat easier install. Building a large home for 2 adults and 4 kids. Go with a dual tank setup or single tankless? Personally, I would go with a single large tankless like the Rinnai mentioned above. Cost up front would be pretty similar but you’ll save long term in energy costs and maintenance. Also, two tanks in the garage will have a big footprint so you’ll be wasting a lot of space if that matters to you. Are there systems that cool water? Like a whole house system so you have colder water at each tap? I don’t believe so. Thanks for the wealth of information and reviews. We are replacing a Bradford White Model M45056FRN2 gas water heater from 2003. We’ve replaced the gas control and thermocouple in 2009 and haven’t had any trouble with it until now. The pilot is now not staying ignited and we have decided to replace the water heater, expecting more problems. You recommend the Rheem Performance Platinum 50 gallon but I’ve read negative reviews due to electrical issues and recalls. I’ve also read negative reviews about the Bradford White. My plumber says he would recommend them both equally. Which water heater would you recommend for a family of 4? Both are good brands. If it were me, I’d go with the Rheem with the deciding factor being the warranty and “usually” slightly lower cost. The Platinum offers 12 years on tank/parts and 3 years on labor. Bradford White is typically 6 years for tank/parts. Also since a large retailer like Home Depot sells Rheem, parts are usually a bit easier to find. Be careful with customer reviews (especially on appliances) since more people are inclined to leave negative reviews on larger purchases. The same people then “upvote” other peoples’ negative reviews in their frustration which in turn bring the negatives to the top making it seem like the product has a lot of issues when in fact it really doesn’t. This would’ve been helpful if they also included Indirect water heaters which, of course, is what I was trying to get info on but unfortunately…Indirect? Ignored. Apologies. Indirect models just don’t get much love outside of Europe. If the price came down (demand would need to go up), more people would be talking about them. The HTP SuperStor’s are probably the most common in the US (example) but Amtrol also gets a good rep (example). Buderus, Burnham, and Crown are also good brands worth considering. If you already have a tank water heater, a water heater timer (like this) is your best (and cheapest) option. If money is no object, a tankless would be totally fine as well but not necessary for what you want. More water heater timer info here. Only comment to add is when hybrid water heaters fail, they fail miserably and very expensive repairs plus high maintenance contracts annually as they are half reverse AC unit half electric water heater. Something to consider before buying. I live inVero Beach fl. And have well water. Do I need to get a glass lined electric hot water tank? All water heaters use some kind of lining to coat the inside of a tank to help prevent corrosion. Glass-lined tanks are by far the most common. Nothing really changes as far as what type of water heater to get when you use well water. Gas or electric doesn’t affect it. The only thing with well water is that you may be more susceptible to having smelly hot water due to the accumulation of hydrogen sulfide gas. The type of anode rod used inside the water heater can make a difference. Check out https://www.waterheaterhub.com/hot-water-smells-like-rotten-eggs-fix/ for more info.